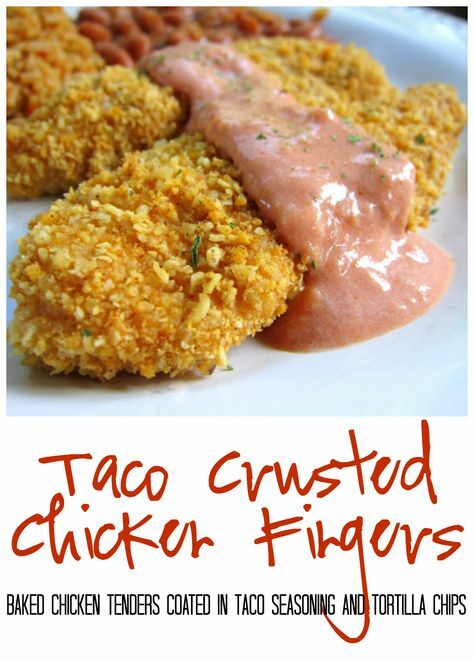 Chicken fingers are one of my favorite weeknight meals. They are easy to make and cook up quickly. These chicken fingers were inspired by the Crispy Cheddar Chicken Tenders I made a few weeks ago. I loved the flavors and the cheese in the coating. 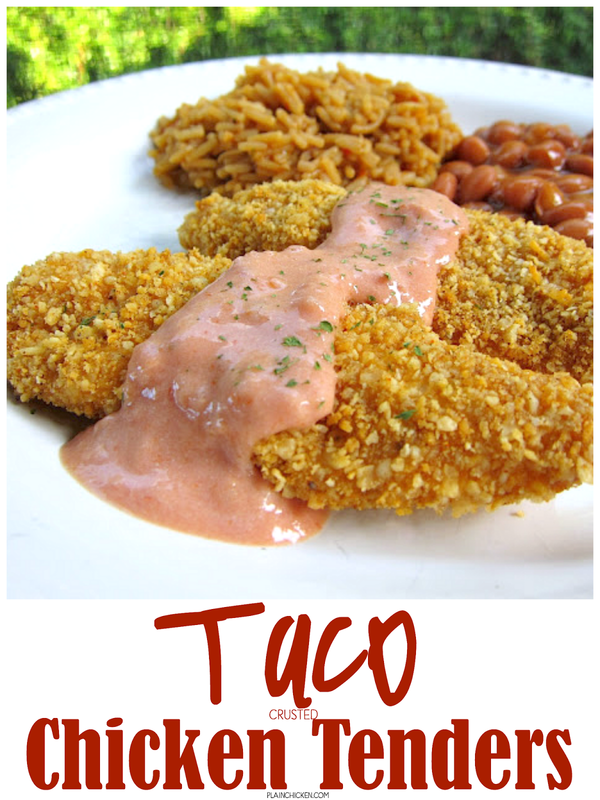 I started thinking about other flavors that would be good and came up with these Taco Crusted Chicken Fingers. I used tortilla chips, cheddar cheese and taco seasoning for the crust. I topped the chicken with a quick sour cream salsa. We both loved this! It was a nice change to our weekly Mexican night. In the bowl of a food processor, combine crushed tortilla chips, cheese, and taco seasoning. Pulse until you have fine crumbs. Pour into shallow bowl. Toss chicken tenders with 1/4 cup flour. In a shallow dish, whisk together eggs and milk. 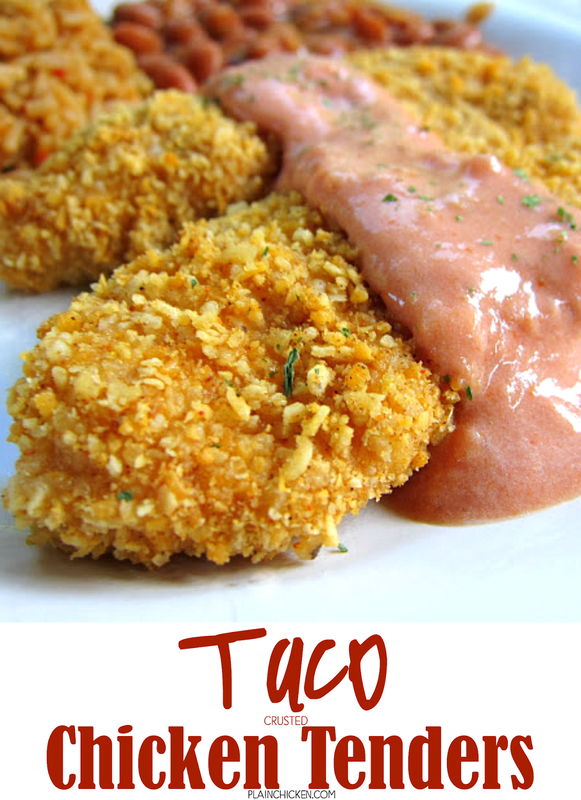 Dip chicken tenders into egg mixture and then coat in tortilla chip crumbs. Place chicken on foil lined baking pan. Repeat with remaining chicken tenders. While chicken bakes, stir together salsa and sour cream. Spoon over baked chicken. A great looking plate of food. Very creative Steph and that coating looks amazingly good. Hi, I'm a new follower. I clicked on a pin from Pinterest from your trial run at Dreamcakes several years ago and thought it was awesome that you're from Birmingham. Me too! Your food looks soooooo good! Will definitely be trying these chicken fingers. We usually just do them Italian style, so it will be good to switch things up! Sounds yummy as usual! Gonna try this next week! Thanks for all of the great recipes! What kind of salsa did you use?? Looks so good! Kaaaaaaarunchy! I like the tortilla chip crust. Looks delicious! Just have a quick question- what would you reccommend using if we don't have access to a food processor? This sounds good! I love your blog and I love Mr. Food. Thanks so much for sharing all your wonderful creations. These look so good. I have made these but used frosted flakes cereal for the crust, it is absolutely delicious. That is a recommended must try if you like a little bit of a sweet taste. I'm not a fan of salsa. Could I sub enchilada sauce for the salsa? I think that would be delicious. Enjoy!